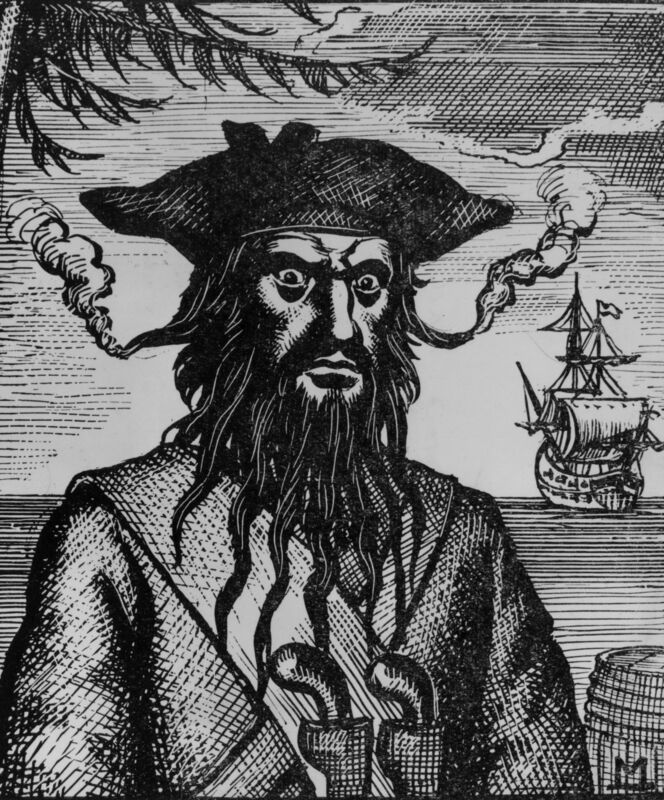 The boldest and most notorious pirate infesting the waters of England’s North American and Caribbean colonies in the early 1700s was Blackbeard. Active during the “Golden Age of Piracy,” the actions of Blackbeard and his contemporaries are an integral part of America’s colonial history. Artifacts recovered from his flagship Queen Anne’s Revenge are exhibited at the N.C. Maritime Museum in Beaufort. The pirate’s infamous deeds spread his name on both sides of the Atlantic; Blackbeard’s name may yet be found in history books, and in the archives and public records in Great Britain, France, Spain, Pennsylvania, Virginia, North Carolina and South Carolina. His original name is thought to be Edward Thatch (also spelled Thach or Thache), and he likely was born around 1680. Blackbeard died in 1718 in a fierce fight off Ocracoke Island. Historical documents suggest either Bristol or London in England, or Jamaica, as possible locations of his birth. Indications are that Blackbeard was born into an intelligent, well-to-do family. He could read and write and corresponded with merchants. He seemed equally at ease with ruffians and governors. Blackbeard is thought to have served in Queen Anne’s War between England and Spain, which lasted from 1702-1713. He is believed to have been a privateer, sailing out of Kingston, Jamaica to prey on French ships for Britain. After the war, Blackbeard reportedly sailed in consort with the pirate crew of Captain Benjamin Hornigold, sailing out of New Providence in the Bahamas. He proved a fierce and able pirate, and captured the French slave ship, La Concorde in 1717 off St. Vincent Island in the Caribbean. Blackbeard transformed the slaver into his flagship and renamed her Queen Anne’s Revenge. Blackbeard crafted his appearance to enhance his reputation. He was described as a “tall spare man” with a long black beard from which he took his name. Before battle he would plait the beard into little pigtails, tie them with colored ribbons and twist some braids behind his ears. Immediately before battle he would light several long, slow-burning hemp cords and tuck them under his hat, allowing wisps of smoke to curl up around his face. He wore pistols, daggers and a cutlass in a belt about his waist. Across his chest he wore a sling that held three brace of pistols, all six primed, cocked and ready to fire. 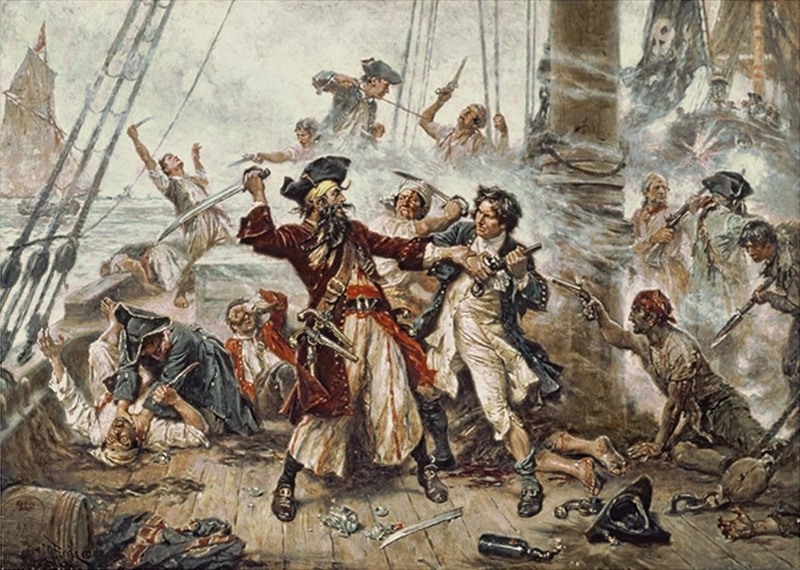 On Friday, Nov. 22, 1718, Blackbeard met his death in a battle off Ocracoke Island. Virginia Gov. Alexander Spotswood leased two sloops with British commanders and crew; each had a pilot from North Carolina. Caught by surprise, short-handed and tricked into doing battle, Blackbeard came to a bloody end. On the blood soaked deck of the small sloop sent to attack the pirate, Lt. Robert Maynard confronted Blackbeard. It seemed a classic face-off of good and evil that demanded death as the only resolution. Reportedly, each pulled pistols and fired upon meeting; Blackbeard missed his mark. Maynard’s shot plowed through Blackbeard’s imposing body. They continued to fight with swords; as Blackbeard moved in for a finishing blow with his cutlass, another seaman approached and slashed his throat. The legend says Blackbeard fought on, in spite of bullet wounds and gashed neck, as other British seamen joined in for the kill. Even while being stabbed, he yet cocked a pistol to continue the fight as he fell dead. His head was then cut off and hung from the bowsprit of Maynard’s ship for the trip back to Virginia as proof of his demise. This information was collected from Blackbeard the Pirate, 1974, by Robert E. Lee and The Pirates of North Carolina, 1960, by Hugh F. Rankin. Additional information was provided by Phil Masters of Intersal, Inc.; Richard Lawrence, formerly with the Underwater Archaeology Branch, N.C. Office of Archives and History; and David Moore, nautical archaeologist with N.C. Maritime Museum in Beaufort.